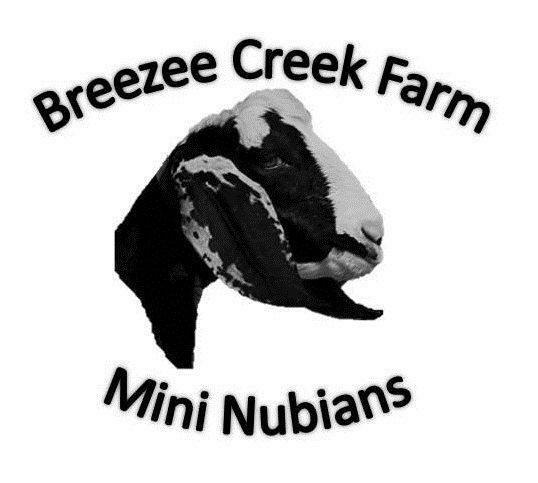 Welcome to Breezee Creek Farm, where we specialize in Miniature Nubian dairy goats. We are located in La Center, Washington, just a 1/2 an hour North of Portland, OR. Our herd is regularly tested CAE free, and is maintained in a closed herd atmosphere. 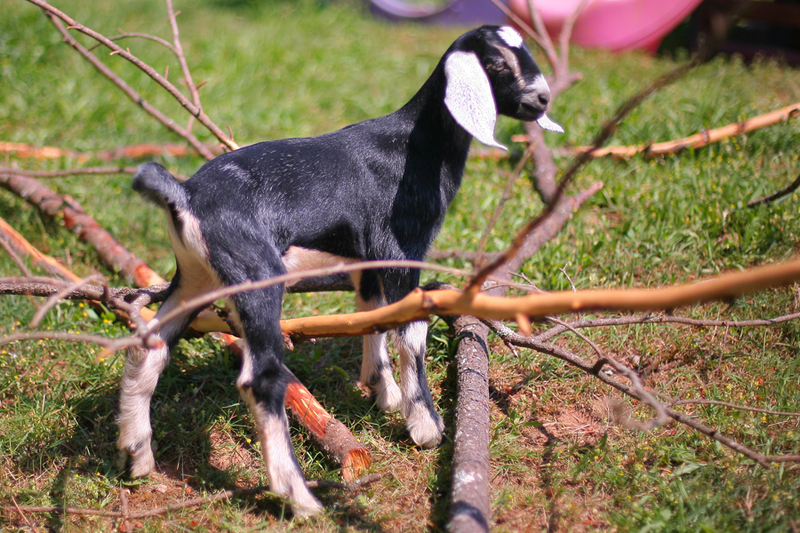 We treat our goats preventatively in a primarily holistic manner using herbs, vitamins, and minerals. 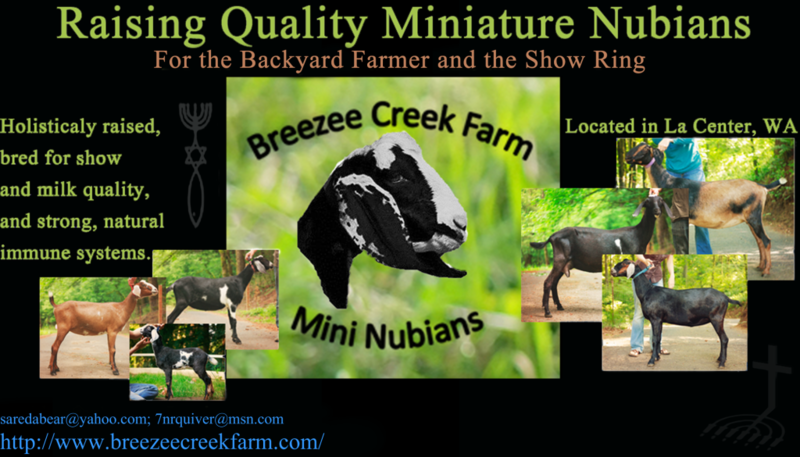 All of our Mini Nubians are from excellent show and milk lines such as Saada, Hidden Creek, Whiskey River Ranch, W4’s Caprine Pursuits, Daystar’s farm and Echo Hill’s farm. We moved here just shy of eight years ago with a dream to raise our 12 children with animals, hard work, home grown cuisine and fresh air. The natural next step once we moved here was to improve the fencing and find ourselves quality animals to raise. We have been connected with gracious friends with many years of experience, and with their help 2012-2013 became our first year breeding. We started with proven Standard and Mini Nubian lines; healthy stock and good milkers. Boy have we learned a lot and still have so much more to go!!! These two verses from the Scriptures are a daily reminder of our great responsibility to manage our herd well. Our desire is to raise up quality animals in a humane way that benefits them as they provide for us so faithfully with a glorious supply of milk, yogurt , cheeses, soap and sometimes even meat. We are attempting this through four acres of healthy fields and pasture and diverse foraging through our several acres of surrounding forestland. Our forests are an abundant supply of many much needed nutrients and beneficial wild medicinals. In our forests we have Oregon grape root, dandelion, oxalis,fern, wild ginger, plantain, maple, birch, pine and evergreen trees. We also grow Hawthorn berry ( a goats favorite), wild raspberry, blackberry, thimbleberry, huckleberry, and wild apple trees. Along with these delicacies our goats receive a daily portion of alfalfa, diverse grass hays, free choice minerals, kelp, and sodium bicarbonate as well as sulphur block, and apple cider vinegar. For our lactating does, they receive in addition; barley ,Oats, raspberry leaf, and a variety of sunflower seeds,pumpkin seeds, and fresh apples, carrots and squashes as available. 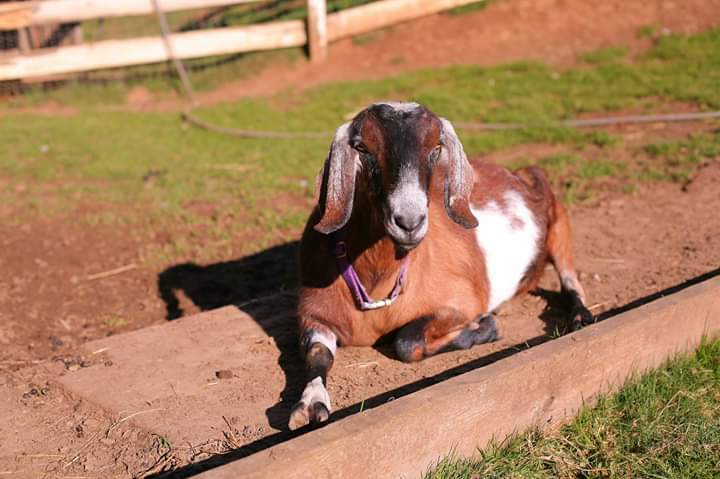 Everything our goats ingest is organic and %100 natural.Our goats receive regular treatments of copper bolus for shiny coats and over all excellent health. In return our goats only provide the best tasting milk and pleasant company. “The standard purebred dairy goat breeds have been pushing for greater stature for the show ring which has resulted in standard dairy goat breeds getting larger in recent years. 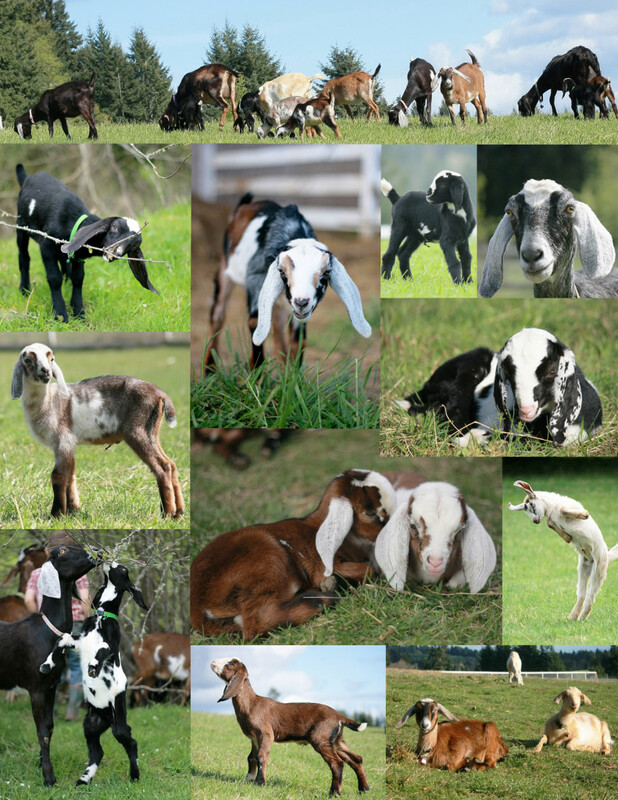 “Standard Nubian goats crossed with Nigerian Dwarf goats result in Mini Nubians, (Miniature Nubians) which are easier for children and seniors to handle than their larger relatives, so hoof trimming, clipping, showing and milking become much easier. 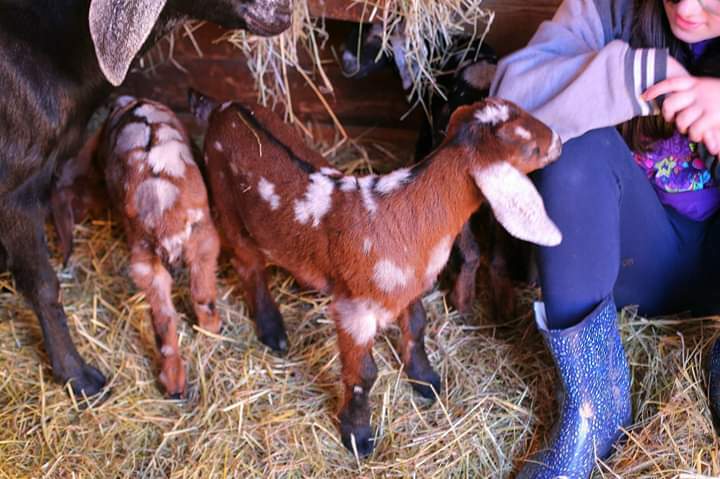 “Feed costs are rising and a Mini Nubian dairy goat can often produce only 1/3 less milk than the standard Nubian dairy goat while often consuming 2/3 less feed. “Mini goats have become more in demand for the pet market too because of their smaller size as well. “The influence of Nigerian Dwarf blood may serve to expand the breeding season past the fall months and increase the butterfat in the milk as well. Well there ya have it from those who have invested YEARS of blood, sweat, and sometimes even tears into the raising up and caring for Mini-Nubians and full size Nubians themselves. Next year we will have many more and we can hardly wait! There will be several to choose from that will be for sale for the right family. Please keep in touch! If you have any questions or are looking for a Miniature- Nubian dairy goat to start or to add to your own herd, please e-mail us and we will be happy to help in any way we can.